The state of Kerala has witnessed a significant decline in agricultural production in the last few decades. In this context, Centre for Public Policy Research (CPPR) has conducted a study: A stagnant agriculture in Kerala: The role of the state that elucidates how excessive government intervention in the form of policies and protective practices, namely, those in land, irrigation, agricultural credit system, price and procurement has created distortions in the agricultural market. This, in turn, has resulted in hampering the growth of agriculture in the state. The Land Reforms Act implemented in 1970 set a ceiling on the absolute size of landholdings by landlords, aimed at redistributing the surplus land among landless labourers and poor peasants. The method of implementation of land reforms in the state, however, has resulted in the fragmentation of landholdings. At present, the percentage of marginal farmers with landholding size less than one hectare is the highest in Kerala among the Indian states, while the agricultural growth here was among the least in India in 2012, according to the statistics provided by the Ministry of Agriculture, Government of India. The imposition of a ceiling on the size of landholdings has resulted in the elimination of scope for entrepreneurship in agriculture. Land was seized from entrepreneurs, who helped in improving the production of food and non-food crops in Kerala through innovative technologies. These lands were distributed among cooperative societies, which were predominantly under political parties. This resulted in large scale corruption in farming practices, leading to a rise in the cost of operation and high cumulative losses, as well as production based on non-scientific methods by marginal farmers. Cooperative Farming Or Coercive Farming? The Land Utilisation Order, 1967, and the Kerala Conservation of Paddy and Wetland Act, 2008, in the name of incentivising paddy farming, pressurised the farmers to carry on food crop cultivation. This was irrespective of the farming conditions and the low profitability of paddy cultivation, putting artificial constraints on the freedom of farmers. Studies based on personal interviews with farmers indicate that there were incidents of widespread crop destruction led by powerful agricultural labour unions targeted at small and marginal farmers, while powerful farmers, who were using paddy lands for construction purposes, were left alone. However, even after, and partly due to, such practices, area under paddy cultivation and production of rice declined significantly. At the same time, these practices created disincentives to farmers for overall cultivation, resulting in the shortage of agricultural labour. A commensurate mechanisation improvement did not take place due to different policy regulations like the Kerala Coconut Husks Control Order, 1973, and protests by trade unions against farm mechanisation, indirectly supported by the successive state governments. Kerala had a centralised management for the irrigation system, which was exclusive of farmers. This government-managed irrigation system was criticised for mismanagement, rent seeking and nepotism by irrigation officials and politicians. In 1985, Command Area Development Authorities (CADAs) were formed in the state to involve farmers in the management of irrigation systems. However, their aim was not achieved due to disregard of farmers’ initiatives with government orders dominating their organisations, farmers losing faith in the officials who promised regular supply of water, constant interference of politicians and the limited role of farmer organisations. Most of the irrigation projects under CADAs were designed for the irrigation of wetland crops, mainly rice, neglecting the specific irrigation requirements of other crops. All these have resulted in very low irrigation efficiency in the state, thus hampering its agricultural growth. The agricultural credit market in the state has been affected by excessive government intervention, which has resulted in creating distortions in the agricultural credit system inhibiting productive capital formation in the sector. Primary Agricultural Credit Societies (PACS), aimed at providing an economical source of short and medium term agricultural credit to farmers in Kerala, were affected by bureaucracy and excessive government reliance. Along with these, high nonperforming assets, capital inadequacy and opposition to automation in PACS resulted in poor service of credit delivery to farmers. According to the latest statistics, only 10.55 per cent of the total disbursement of Rs 71,301.88 crore by PACS were utilised for agriculture and only 0.21 per cent of this agricultural credit was for long-term agricultural purposes. District Cooperative Banks also gave priority to short-term credit over medium-term agricultural credit like PACS. These resulted in an increase in the share of production credit in the total agricultural credit and a significant decline in the share of investment credit, which is the main driver of private capital formation in agriculture. The model of a centralist-planned economy was followed in Kerala with agricultural products to be sold to the government at government-determined Minimum Support Prices (MSP), and not based on market demand and supply conditions. This created price distortions in the market. Kerala is reported to be the state with a steep rise in the government procurement of rice, of around 48 per cent in the last few years, while there has been a significant decline in the production of rice with a negative growth rate in this period, with lower availability of rice in the open market. Excessive government intervention in the marketing mechanisms in agriculture, namely, restricting marketing through cooperative societies, created artificial constraints on farmers, thus disincentivising them and ultimately leading to the collapse of agriculture in the state. The study thus shows that disincentives generated by the successive governments in Kerala through imposing artificial barriers on the freedom of farmers and agricultural entrepreneurs have resulted in the collapse of agriculture in the state. The interests of farmers and market conditions were not considered while framing the policies and practices. 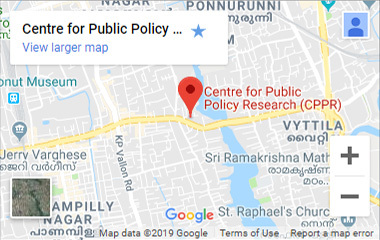 *Lekshmi R Nair is the Centre Manager, CPPR-Centre for Comparative Studies and D Dhanuraj is the Chairman of Centre for Public Policy Research. The views expressed by the author is personal and does not represent that of CPPR.